When you visit our Cape Cod Bed and Breakfast, we will do our very best to provide you with information we hope will be helpful in your exploration of the Cape. If you have never visited the Cape (as we locals call it), it may be helpful for you to learn about the various villages and towns that make up this lovely area that attracts so many visitors each year. There is so much to see and do here and we hope this over-view and website links will help you in planning your Cape Cod visit. Cape Cod is made up of three distinctive areas; Upper Cape, Mid Cape, and Lower Cape. This blog will feature an overview of the villages and towns of Upper Cape Cod. Our Cape Cod Bed and Breakfast is located in the town of Sandwich which is part of Upper Cape Cod. 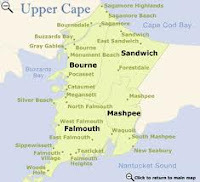 The Upper Cape consists of the villages of Sandwich, Bourne, Falmouth (and Woods Hole), and Mashpee and is the part of the Cape in the nearest proximity to the mainland. Sandwich is where Cape Cod Begins. It is located just an hour from both Boston, Massachusetts and Providence, Rhode Island, where major airports are located. Settled in 1637 and incorporated in 1639, Sandwich holds the distinction of being the oldest town on the Cape. As you travel the winding back roads and pathways of old Sandwich Village, you are strolling through living history surrounded by distinctive boutiques, restaurants, and unique lodging choices. Located in the village are many working museums, art galleries, and a multitude of opportunities for exploration, recreation, and relaxation. Sandwich has it all. Spend time visiting our many museums, bike the Cape Cod Canal Bike Path, stroll through the 100 + acres of beautiful Heritage Museums & Gardens, take a jam making class at the Green Briar Nature Center Jam Kitchen, walk on the beach, and by all means enjoy some wonderful local cuisine. See the “What’s Inn Our Sandwich” page on our website to read about some of the reasons people from all over the world come to visit. Bourne is located adjacent to Sandwich. The town of Bourne is made up of nine villages, one of which is Gray Gables. During the 1890’s, this village was home to the first summer White House where President Grover Cleveland spent vacations. The village of Buzzards Bay is a commercial center with views of Buttermilk Bay. The Cape Cod Canal Bike Path runs through Bourne and the Aptucxet Trading Post is located there. Bourne is also home to the Massachusetts Maritime Academy, the country’s oldest co-ed maritime college. South of Bourne is the town of Falmouth, the second largest town on Cape Cod. Falmouth has 14 harbors and numerous saltwater inlets. At Falmouth Harbor you can catch the Island Queen, a quaint pedestrian ferry, to the village of Oak Bluffs on Martha’s Vineyard. The author of “America the Beautiful,” Katherine Lee Bates, was born and raised here. There is a beautiful downtown area with a Town Green that was once a common cattle-grazing area. Falmouth is home to historic Highfield Hall, which was built in 1878. The 20,000 square-foot restored Victorian mansion is open to the public April through October. The former stable for Highfield Hall now houses the Falmouth Theatre Guild, where Broadway musicals are produced fall through spring. In the summer months, the theatre is home to the renowned College Light Opera Company. Visit their website for a complete listing of performances. Located in North Falmouth is Old Silver Beach. This white sandy beach is a great place for sunbathing and watching the sun set. Falmouth is also home to the Shining Sea Bike Path, which is a lovely 8-mile ride along the coast with a beautiful view of Nobska Light. A part of Falmouth is the Village of Woods Hole. This charming village is home to three world-class scientific institutions: Woods Hole Oceanographic Institute, the Marine Biological Laboratory, and the National Marine Fisheries Service. The beautiful Nobska Lighthouse is located here and is open to the public with limited visiting times. Woods Hole has many charming restaurants including Fish Mongers and a bakery that is a personal favorite of this innkeeper, Pie In The Sky. The Steamship Authority ferries to Martha’s Vineyard depart from Woods Hole. Mashpee, the only Cape Cod town with a Native American name, was home to one of the Wampanoag tribes (the Massipees) long before European settlers arrived. The Indian Meeting House located on Route 28 in Mashpee is still used by the tribe for meetings, events, and religious services. Mashpee is home to Mashpee Commons, one of the most upscale village-style shopping centers on Cape Cod. The Commons has become a community hub, hosting events and concerts throughout the year. We hope to welcome you to our Inn very soon. Sandwich is a great place to stay and explore the rest of Cape Cod and the islands of Nantucket and Martha’s Vineyard. See the “Specials” page of our website for packages and specials.